Well, this year certainly exceeded my expectations in terms of giftage. I got all I asked for and even more. I only asked for 11/22/63 by Stephen King and Seasons Five and Six of Dragonball Z. My dad got that plus Seasons Seven, Eight, and Nine of DBZ. I now have the complete series! All 291 episodes! Now I can focus on collecting Dragonball and Dragonball GT. I also got The Rite on DVD, some beef jerky, a few new t-shirts, a Ray Stevens Greatest Hits collection, and a new pair of pajama pants. I've already got this Ray Stevens CD, but I didn't have the song Jeremiah Peabody's Poly-Unsaturated Quick Dissolving Fast Acting Pleasant Tasting Green and Purple Pills. Unfortunately, the new CD I got didn't have the original early sixties version, but instead it had a more modern remake. Anyway, those were my Christmas gifts. This photo might not actually happen if the Colts win out because they'd lose the first pick in the draft to the Rams or Vikings. Now both teams have quarterbacks and they might not draft Luck, but they might anyway because of the whole "best player available" thing. There are four games left in the NFL season and there are four more chances for the Colts to get a win. There is no doubt that this year's team is one of the worst teams in NFL history, but if they can get a win then they won't be labeled as the absolute worst. 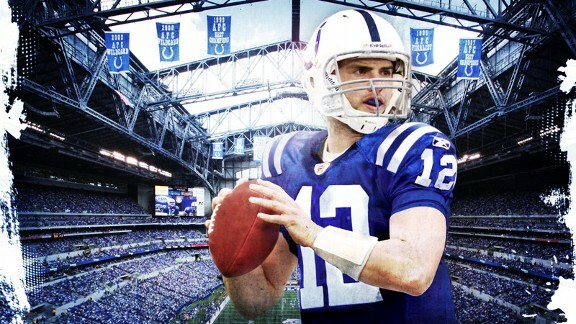 The question is where will the 2011 Colts rank on the list of the worst teams in the NFL. If they win just one then they are taken out of contention for the number one spot on the list of the NFL's Worst Teams of all Time. Maybe even out of the top two. (*) The NFL Network sought to include every team from the 1990's Bengals in its top ten worst teams of all time list. As you can see they only boasted a winning season once between '90 and '99. With four games left to go I wonder if the Colts can avoid making this list. With Baltimore, Houston, Tennessee, and Jacksonville left for them to play the chances are high that they might get one win. Maybe, call me an optimist if you want, they can get two wins. If the Colts and Dan Orlovsky play like they played against the Patriots then just maybe they could get three wins. I don't know how much hope I have in that scenario, though. Just get one because I really don't want the Colts to be ranked as the worst team of all time. There are a lot of movies that I like to watch during this time of year as I'm sure there are for you. There are no cartoon shorts on my list because then my list would go on forever. So I'll settle with movies. Now my definition of "Christmas/Holiday" movies may be different than your definition. Die Hard takes place around Christmas time and some folks consider it to be mandatory holiday viewing, but I don't really consider it a Christmas movie. That doesn't mean I don't love it, though. The Shop Around the Corner, Grumpy Old Men, Batman Returns, and Gremlins all could be on the table as Christmas/Holiday movies, too. And while any movie with the Penguin in it gets browny points from me I don't consider Batman Returns to really be a Christmas flick. I do know that just because a movie has snow in it doesn't mean it is a Christmas movie. If that was the case then John Carpenter's The Thing would be on my list. I thought about whether I should put any religious movies on my list because I am a fan of a few, but I decided against it. I'll save those movies for another list and for another time. National Lampoon's Christmas Vacation (1989) - This movie is one I watch every single year no matter what. I think it is the most essential and most honest Christmas movie I've ever seen. 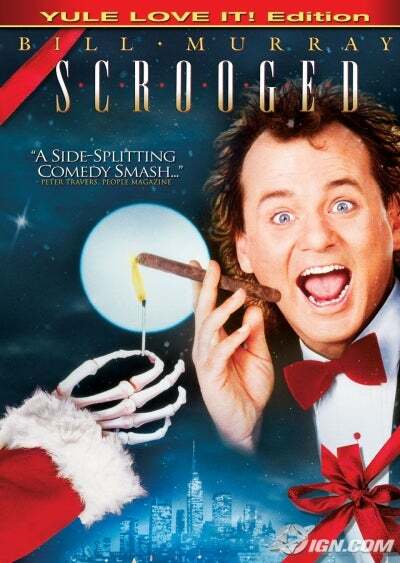 Scrooged (1988) - Any movie that has the singer for the New York Dolls portraying a cab-driving Ghost of Christmas Past is a great movie in my book. Bill Murray did a great job as the crazy Frank Cross and his transformation at the end is really a classic. But if you want a "straight" version of A Christmas Carol then look elsewhere. Scrooge (1951) - I can count the amount of Alastair Sim movies I know on three fingers. I know he was in many more so I am not trying to say he is a bad actor, but his most memorable role has to be that of the curmudgeon Ebenezer Scrooge. I've liked this movie for about as long as I can remember. When I was in the third grade I brought the movie to school so the class could watch it. I think most of the kids fell asleep because it was an old movie, but I didn't. A Christmas Carol (1984) - I don't know if this film is better than the 1951 adaptation, but I definitely think it's as good. George C. Scott is one of my favorite actors and I thought he did a wonderful job. The Polar Express (2004) - I really enjoyed the book as a kid and I love the movie adaptation. Of course the movie added a lot more because the book was only 32 pages, but everything the movie adds doesn't take away from the original story. It's a Wonderful Life (1946) - Yeah, this is pretty much on every Christmas list. But I don't think a list is a list unless there is a James Stewart movie on it. Bad Santa (2003) - I know, okay? I should be ashamed of myself for putting this on my list, but I love this movie and it is one of my favorites. It's probably more comparable to Jackass than any other Christmas movie. It makes Scrooged and Christmas Vacation look pretty tame, but it does have heart. I think it does anyway. Planes, Trains, & Automobiles (1987) - It's a Thanksgiving movie, but I'll include it here because it is always the first movie I watch before I really start cranking out the Christmas movies and because it does fit the "Holiday" theme. Steve Martin's almost Scrooge-like transformation from uptight snob to caring and tolerant person makes it all the more a Christmas movie in my view. The Bishop's Wife (1947) - Cary Grant is an angel named Dudley trying to set things right between a bishop (David Niven) and his wife (Loretta Young). Miracle on 34th Street (1947) - This is probably another movie that is on every list. The Bells of St. Mary's (1945) - I really like Going My Way as well, but that movie doesn't really feel "Christmas-y" to me. I guess this movie isn't really "Christmas-y" either, but it does have that tone. The Santa Clause (1994) - Tim Allen kills Santa and takes his job. Home Alone (1990) - Hard to believe Joe Pesci is the same guy from Casino or Goodfellas, isn't it? The guy has range. This was also the second movie to feature the dynamic duo of Macaulay Culkin and John Candy. Well, maybe "dynamic duo" is overstating things a bit. Anyway, the first movie they were in together was Uncle Buck. How the Grinch Stole Christmas (2000) - I like Ron Howard's rendition and Jim Carrey's performance. I know Carrey is no Boris Karloff, but I don't think anyone other than Carrey could have pulled this movie off. I've heard folks say that they don't like this movie because it's a bad adaptation of Seuss' story, but I still think it's a good movie in the way that Polar Express is a good movie. Anyway, that's my list. And nope, there's no Christmas Story. That movie has never really been my cup of tea. I thought about putting the 1932 version of A Christmas Carol on the list, but I don't really like that one as much. The only thing I really like about the movie is Gene Lockhart's portrayal of Bob Cratchit.